A unique plastic coating on the tips of the tweezers insulate them and provide resistance to heat and chemicals. Ideal when cleaning with ultrasonics. Made from stainless steel. 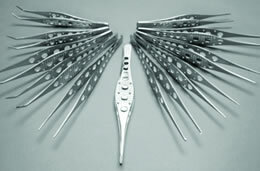 The set consists of 6 heavy duty forceps that are mandatory in the lab. 5" (12.7cm) long, molded, strong, durable, autoclavable up to 275°F (135°C), serrated tip. All plastic. 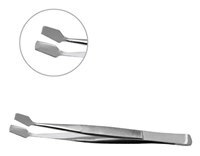 These forceps are excellent for handling hot, cold, corrosive or contaminated objects. Made from blue poly-propylene with interlocking teeth. A catch locks tips tightly for use as a clamp. 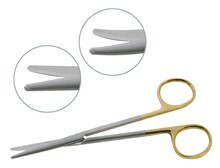 Scissor type handles with double action hinges makes this forcep a useful cryo tool, and great for handling stubs. Straight, "PTFE" coated tips, corrosion-free. Offers a soft and good grip to handle delicate articles. Overall length 3⅞" (98 mm), medium points. Full length "PTFE" coated, 98mm long, serrated, curved tips. No conductivity. Full length 4½"(114.3 mm) "PTFE" coated, straight, flat tip forceps. It offers a good grip and easy handling of cover glass and glass slides. This device is actuated by one thumb. Its three prong claw is handy in the picking up of small items up to 2¼" in diameter. With broad and strong tips. Serrated jaws. These forceps offer firm gripping action. 4" (100mm) overall length, 1 1/16" (38mm) "PTFE" tips; corrosion resistant. Curved shape with a strong fork. Individually blister packed. Ideal for handling balance weights. 6" (152mm), Stainless Steel, Medium fine tips, curved smooth points. 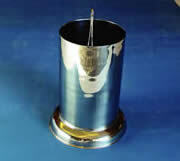 Made of stainless steel with wide base and polished finished. 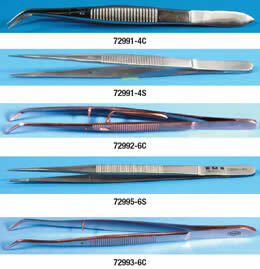 These conventional forceps are very popular and are available in a variety of length, tip, and handle styles. 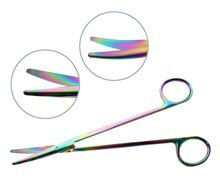 Electron Microscopy Sciences is proud to announce a unique line of sterile forceps. The base is plastic and the tips are 316 stainless steel. Sharp Tips, 11.5mm Curved Jaws. 80mm Handle, Overall Length 102mm. 0.12mm 1 x 2 Teeth, 6.5mm Tying Platforms. 80mm Handle, Overall Length 100mm. 6.5mm Tying Platforms. 80mm Handle, Overall Length 100mm. 10mm Tips, 0.25mm Notch. 80mm Handle, Overall Length 100mm. 0.5 x 8.7mm Tips, 45° Angled Shaft. 80mm Handle, Overall Length 100mm. Available in 4 styles. All feature a paddlestyle, fine-grooved handle. Available with either smooth, serrated, needle tips, or with 1 x 2 teeth. 178mm versions are for those preferring a longer forcep and a wider variety of tip choices. Curved styles are well suited for retreiving specimens from the inside perimeter of transport jars and tissue separation in the water bath. Available with either smooth, serrated, needle tips. 5-1/2" (139.7 mm) ergonomic versions for those who prefer a shorter forcep. 4 ¾" (121mm), Stainless steel with fine serrated jaws. Stainless steel forceps with serrated tips. Stainless Steel Forceps with 1x2 teeth. Made from stainless steel, medium points, serrated tips and alignment pin, curved or straight tips. Available in 4" and 6" long. Only curved type A tips comes with locking device. Please see listing in Histology. Stainless steel jaw forceps with a guide pin. Curved, serrated tips. Stainless steel, straight fine point, serrated tips and a guide pin. Stainless steel, 4½" long, 4 mm jaw. Without catch. Stainless steel 6" (155 mm) long or 8" (203 mm). With special cupped pattern for superior grip. Cup area is 6.5 mm wide, 9 mm long. 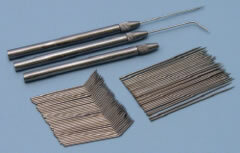 Stainless steel, long, serrated fine tips, for easy removal of specimens from deep containers. Scissor type. 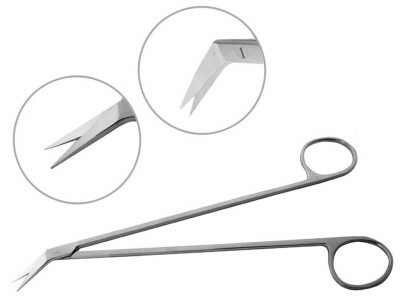 Stainless steel hemostatic forceps with box lock joint and serrated jaw. 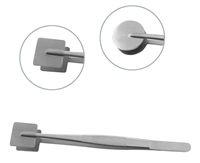 Paddle forceps hold all types of tissue with the secure grip needed to accomplish thin sections for histology analysis. Thin sections are essential for proper infiltration of reagents prior to histology study. Great for training residents and technicians on thin section technique, cutting thin sections of fatty tissue like breast tissue and cutting even thickness sections of any type tissue. Same as above with extra wide paddle forceps. 1⅝" wide. 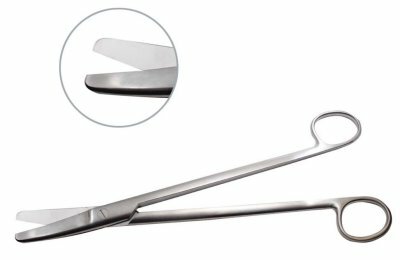 Soft rubber tipped forceps allow for secure dissection with minimal tissue damage or compression. An excellent option for techniques that require no metal exposure. Blue tips provide excellent contrast for specimen photography. Warning: These forceps are not autoclavable. To clean rince under water or wipe clean with any laboratory disinfectant. 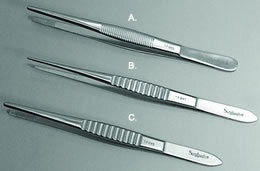 Forceps specifically designed for handling microscope slides. These dissection tooth forceps are made of stainless steel and feature serrated ribbed grips. We offer them in a wide variety of lengths and with varied teeth standard pattern tips. These standard pattern tissue tooth forceps provide a secure ribbed grip. Available with assorted variable tips for delicate to coarse dissection. Serrated handles. No need for a pair of forceps and a ruler in your work area! These serrated forceps are imprinted with metric guides on the tips. With up to a 50 mm ruler on both forcep lengths, they are made for precise and accurate dissections. Made of stainless steel. Available in two lengths. These forceps feature extra-fine serrated tips with a ribbed grip. The magnifier provides 10x magnification to the extraction field. This unique sharpener allows for the sharpening of scissors in its native state. No need to break apart. The unit is 115V, 60Hz. The EMS Potts-Smith Dissecting Scissors feature angled tips for those hard-to-reach places during dissection. 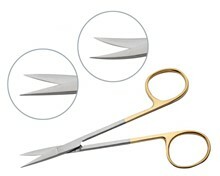 These scissors are finger-friendly with a ribbon handle. Extra sharp, with single serrated edge. 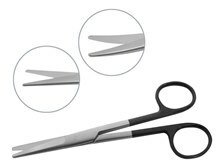 The double curvature of these scissors makes dissection easier in hard to reach areas or where a clear view is not always an option. Made in Germany of premium grade stainless steel. They measure 4⅝" (117.4 mm). These extra heavy-duty scissors made from premium German stainless steel come in two different types. They have blunt tips – one curved, the other straight. Both measure 10½" (266.7 mm). 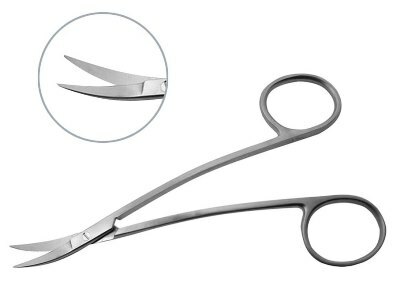 These scissors are excellent for small surgical incisions and gross dissection.These scissors are made from standard grade stainless steel and they feature an angled end and lower probe point tip. These general purpose surgical scissors are large and sturdy. 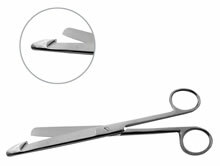 These scissors are ideal for pulling away tissue during cutting and work for all surgical procedures. 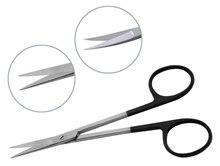 The scissors are 8.25" (210 mm) in length and are available in two grades of stainless steel, standard and premium. 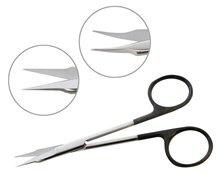 These Iris scissors are made with sharp tips and are perfect for precise vascular and neurological dissection; ideal for small specimens and animal dissection. Choose from standard or premium grade stainless steel, we offer multiple varieties. 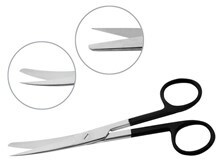 Our SuperCut scissors are made in Germany using the highest grade of surgical steel. They are tempered and hardened for an extended and sharper life than ordinary steel. The SuperCut blade has a specially designed sharpened edge. They also feature rounded and polished finger rings. 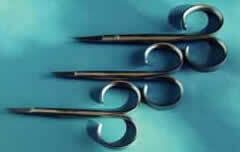 They are manufactured with a curve to attain the hard to reach delicate tissue or angle dissections. These are made from stainless steel with sharp/blunt tips. Available curved or straight. 5½" (139.7 mm) in length. These are made from premium grade stainless steel with narrow blunted tips and a razor sharp cutting edge. Multiple varieties available. 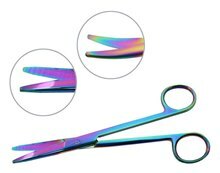 These Tenotomy scissors are made with premium grade stainless steel and have narrow sharp tips with a razor sharp cutting edge. They are helpful with delicate dissection. These Iris blade has a specially designed sharp end. The straight version can cut into surface area tissue while the curved version can cut into heavier or deeper tissue. The unique tungsten carbide cutting edge provides effortless, yet accurate, cuts through the toughest of surgical or autopsy tissue. 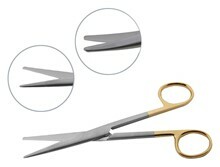 Scissor shanks are tempered to the ideal hardness to allow proper flexibility and comfort. Finger rings are well rounded and polished allowing better feel while preventing finger fatigue during complex dissection cases. These are made from Tungsten Carbide and come with either sharp/blunt or sharp/sharp tips in curved or straight. 5½" (139.7 mm) in length. These are made from Tungsten Carbide and have sharp/sharp points. 4½" (114.3 mm) in length. These are made from Tungsten Carbide and have narrow blunt tips. These are made from Tungsten Carbide and have blunt rounded tips. Titanium Alloy scissors weigh approximately 25% less than stainless steel, making them the first choice for many technicians. Titanium Alloy instruments keep edges sharp longer than traditional instruments and are more stain resistant than stainless steel. Made of standard grade titanium alloy. Note: Do not use bleach or other caustic chemicals. 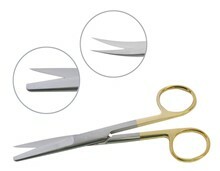 Metzenbaum scissors have a longer handle to blade ratio and can cut extremely delicate tissue. Made of standard grade titanium alloy. These are helpful in cutting into the facial region. Made of standard grade titanium alloy. With a straight cuttting edge, these scissors are highly recommended for infectious cases. 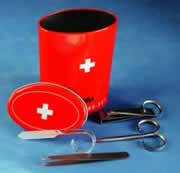 Disposable instruments designed specifically for single use only. Package of 12, not autoclavable. Extra fine, curved blade. Recommended for Miniature work. OAL: 90mm, Inox. Extra fine, straight blade. Recommended for Miniature work. OAL: 90mm, Inox. Extra fine, curved blade. Recommended for Close Tolerance Cutting. OAL: 90mm, Inox. Extra fine, straight blade. Close Tolerance Cutting. OAL: 90mm, Inox. Round, curved blade. Recommended for heavy-duty miniature work for general use. OAL: 90mm, Inox. Extra-fine, curved blade. Recommended for heavy-duty miniature work for general use. OAL: 90mm, Inox. Round tips, curved blade. Recommended for heavy-duty miniature work for general use. OAL: 90mm, Inox. Silicone and Chloride Free. Recommended for soldering, high temperature (1400°C) and strong chemical environment applications. OAL: 115 mm, Stainless Steel Handles, ceramic tips. 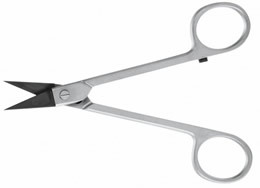 High quality scissors, manufactured from hardened, anti-acid, stainless, surgical steel (CA). Handcraft with precision sharpened blades that provide a perfect cut. 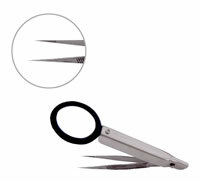 The Rubis Twist® grip scissors offer ergonomically, comfort and control. 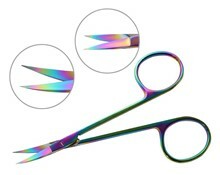 110 mm (4⅓") long, Sharp pointed micro scissors. 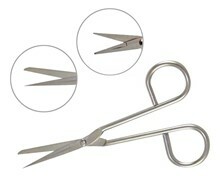 Long legged scissors with rounded tips. Short, delicate stainless steel scissors with a spring handle. Multi purpose sheer with stainless steel blades and plastic handle. One blade is serrated that allows you to cut materials from wire to bone. Autoclavable to 120°C. Stainless steel sheer for cutting paper; black enameled handles. Nichrome wire. An 8" aluminum handle with a 3" nichrome wire, 25 gauge. Loop outside diameter is 4mm. Loop inside diameter is 2.5mm. Available with a loop or a needle. Stainless steel, 5" long, 2mm diameter. Flat one end with eye. Chrome Plated. 6" long, one blunt bent end, and one chisel finish on the other end. Probe set include two-way handle and four probe heads. These probe heads (A, B, C, D) are easily screwed into the handle (H). This set is very convenient for field work or on the move. The combination of high precision tweezers with magnifier offers you easy handling of small parts and become handy where a microscope or magnifier isn’t at hand. 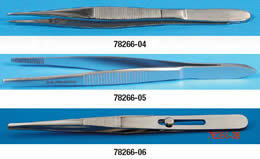 Tweezers is 90 mm long, 100 mm total length with 3¾X magnifier. 1) Stainless steel with spear shaped head, 5"(127mm) long. 2) Wooden handle, needle tip. 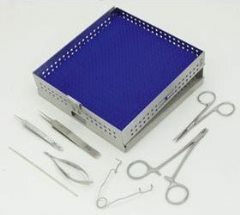 These microsurgical instruments are available in a kit with a storage cassette and mat, or you can purchase just the instruments themselves. Storage cassette: 6.5" x 6.25" x 1.25"
1 Dissecting scalpel, 6" long, 1½" cuting edge. Made from stainless steel, pin-vise type Handle, which accepts either dissecting needles or a knife. This skin punch will pierce dense skin with ease. The rotating hole template offers five (5) different hole sizes. Made from stainless steel. Allows for you to make a 2mm hole through the animal ear in just one second. It also can be used as a specimen puncher. Easily punch an animal ear quickly with this ear punch. This ear puncher is small and efficient and features spring action. It allows users to come closer when marking an animal, and also has a sloped edge for clean cuts. It is autoclavable, but should be lubricated afterwards for long and trouble-free usage. It measures 11 cm long and has a 2 mm diameter hole.